Offices in China, 1919, $2 on $1 violet brown, o.g., never hinged, near perfect centering and beautifully balanced margins, deep intense color, Extremely Fine and choice; with 1998 and 2015 P.F. certificates, the later Graded (XF 90, SSV $2,000). A CHOICE NEVER HINGED EXAMPLE OF THE OFFICES IN CHINA $2 ON $1 HIGH VALUE. 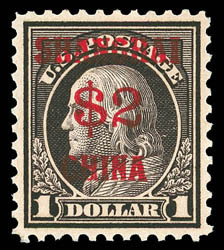 Offices in China, 1919, $2 on $1 violet brown, double surcharge, bold socked-on-the-nose strike of "U.S. Pos. 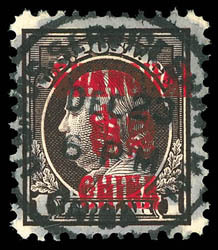 Service, Shanghai, China, Dec. 23" town cancel, choice centering within large oversized margins, rich color, an Extremely Fine jumbo; with 2014 P.F. certificate. A STRIKING USED JUMBO EXAMPLE OF THE OFFICES IN CHINA $2 DOUBLE SURCHARGE ERROR.